Would You Please Consider Fostering? American Greyhound is always looking for foster homes to host these new retirees while they wait for their forever families to come along. All veterinary and medical care costs are covered by the organization and we will supply you with a kennel and any other supplies you may need for your foster. We ask that you provide a roof over their head, a couple of meals per day, and and some love. We still need foster homes for the upcoming haul to Alabama in early March. Fostering a greyhound can be whatever kind of commitment you’d like it to be. Whether you’d like to foster just 1 greyhound or 100, we want you as a part of our fostering team! Thinking of adopting a(nother) greyhound? 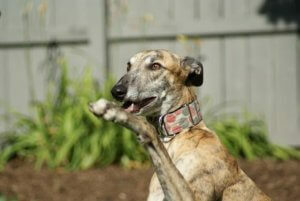 Fostering is a great way to see if a particular hound is the right match for your family and home. We call this “fostering to adopt”, and it is a great way to contribute to the fostering mission as well as finding the right hound for your family.